A while ago I was picked to be a Rainbow Toy Tester. I've been waiting patiently ever since to see what toy we would be sent. 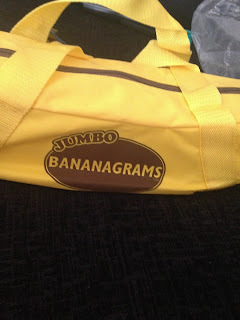 I was finally put out of my misery a couple of weeks ago when we were sent a set of Jumbo Banagrams to test and play with. This game is similar to scrabble in the sense that you have to make words out of the tiles however this is where the similarities end. You don't take it in turns to make the words, oh no, this is a race to the end, making as many words as you can and in the end you get left with what looks like a giant crossword. The tiles are made are made from a water resistant material making them suitable for both indoor and outdoor play, great for when the sun makes an appearance as you can play it out on the grass and they can easily be wiped clean after if they get dirty at all. There are that many tiles, 144 to be precise, that you can have up to 6 players playing the game, however I did find that the tiles were extremely heavy when all put in the banana carry bag together so although it is a brilliant idea that you can transport them anywhere, I would suggest that only the parent carries them as we wouldn't want any injuries!!! 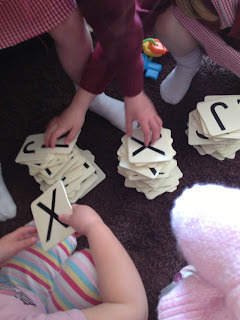 The thing that really stands out for me is that it isn't just a game for fun, it enables you to teach your child how to spell certain words, so they are learning as well as playing and I am a huge fan of educational games. 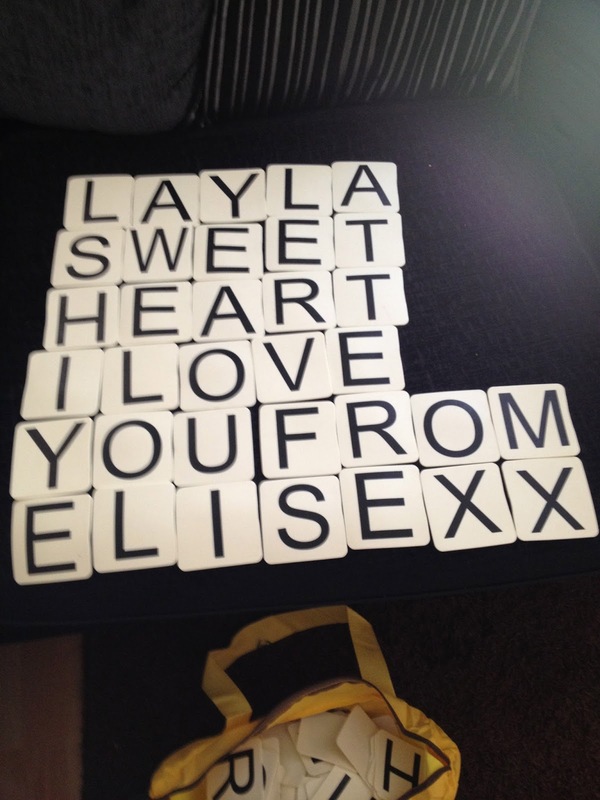 I will mention that all the letters are printed on the tiles in capitals, this I would change, I would like to see them all in lower case as this is how children are taught in school. 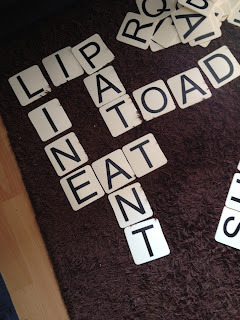 As you can see from the above picture, my children found other ways to use the tiles instead of just sticking to the normal game play. 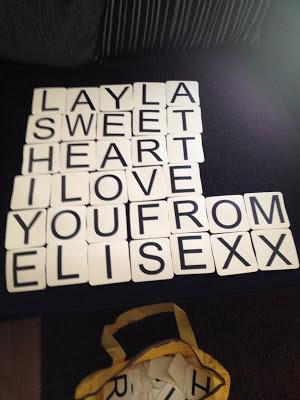 I found this message from my eldest daughter to my youngest daughter very cute. My kids and I really loved this game, great fun for both children and adults and because there are no boards, pencils etc required, you don't have to worry about losing any pieces. It is great at getting friends and family socialising and having fun whilst helping your kids to gain knowledge at the same time. Definitely one to have in the games cupboard. Disclaimer : we were sent this game free of charge to be part of the rainbow toy testing program however all thoughts and opinions are my own. Disappointingly, I was also on their list of bloggers but haven't received anything so looks like we missed out. 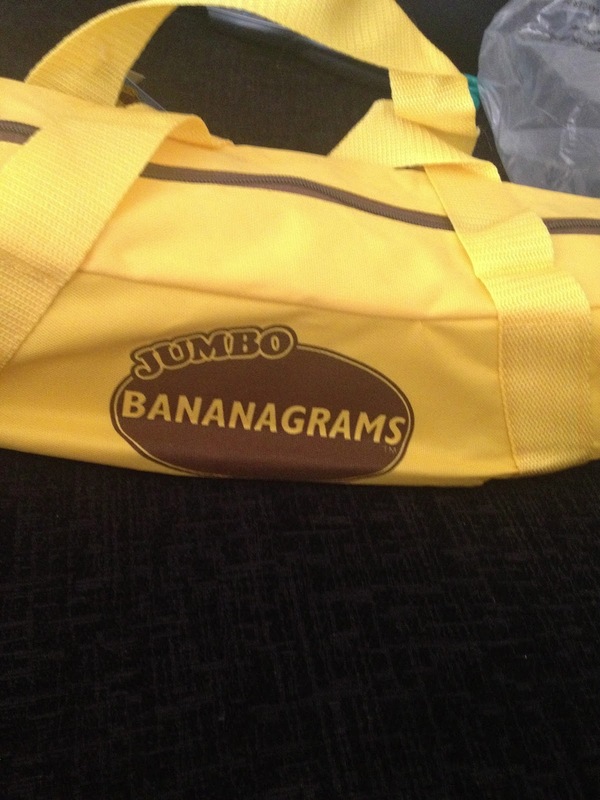 The bananagrams looks great. Always good to have a fun but educational game. Aaaww I'm sure you will get something, I know a couple of other people that haven't received something yet either, maybe just running behind schedule.